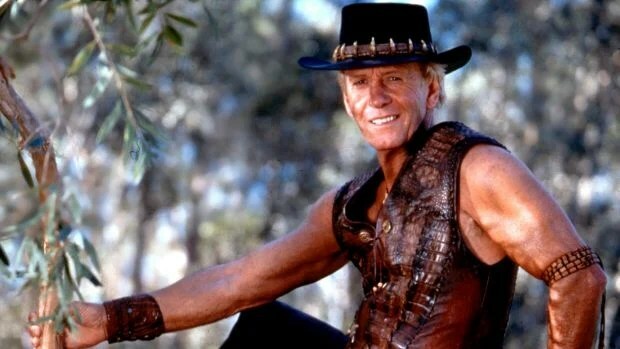 30 years after Australian actor Paul Hogan delighted audiences as Crocodile Dundee by wrestling wild animals and muggers with his massive knife, a reboot (titled Dundee: The Son of a Legend Returns) is in the works with Danny McBride as Brian Dundee. Without warning, the Rimfire Films released a 40-second teaser trailer over the weekend that stunned the entire world. Crocodile Dundee is making the most unlikely Hollywood comeback ever. “Throughout the past few years, I’ve been thinking about how to bring Dundee to a new generation,” Hogan told People magazine as he unveiled the surprise clip. It seems this is something that has been in the works for some time. However, nobody would have expected McBride, who often appears in adult comedies alongside Seth Rogen, to get the part. “I’m not going to lie to you, to be a real Crocodile Dundee, I think 95 percent of it is the vest and then five percent is just being able to not fall down and stay on your feet,” said McBride in a statement released by Australian production house Rimfire Films. In the trailer, McBride fumbles a large knife and attempts an Australian accent by delivering Crocodile Dundee‘s best catchphrase. “That’s not a knife. That’s a knife.” Australia will never be the same again. Crocodile Dundee is back. Well, actually, he’s missing in the Outback. And the only person who might be able to find him is the loudmouthed American son no one knew he had. Introducing Danny McBride as Brian Dundee, this son of a legend is forced to channel his Aussie roots as he embarks on the adventure in the land down under. It’s time to live up to the family name. Wow. Finally an answer to the question literally nobody ever asked. Why, oh why! Make it stop. Chances are it will be rubbish, most remakes are. Some movies should just be left alone. I agree..crocodile Dundee is a great movie from the 80’s..leave it alone..and they wana use that idiot to play the title..seriously! Why did we need this film?